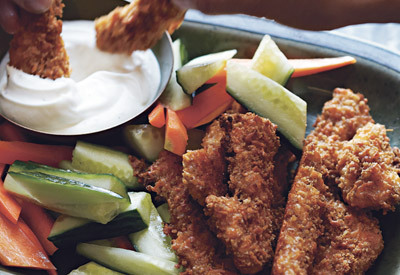 Crisp cheesy coating and juicy chicken meet creamy, tangy dressing. Just try to remember: No double-dipping. 80%DV vitamin A, 70%DV vitamin C, 25%DV calcium, 10%DV iron. Spray baking sheet with cooking spray. Open FRESH TAKE bag; pull apart center seal. Mix contents together. Place on prepared baking sheet; top with remaining cheese mixture. Bake 15 minutes or until chicken is done. Serve with vegetable dippers and dressing. Substitute BREAKSTONE'S or KNUDSEN Sour Cream for the dressing. Discard any unused cheese mixture.